This comes via Stuart Staniford, and it’s not really anything new. Still, I wonder how many people realize just how strongly the oil industry has boomed under the Obama administration? 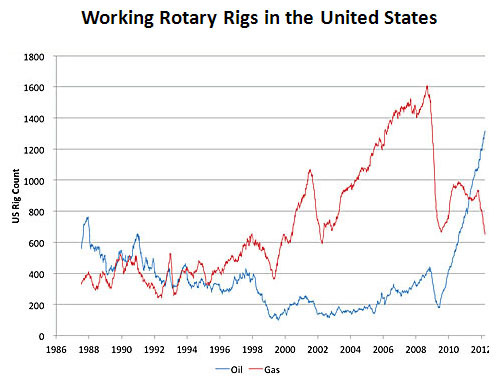 The shale gas boom (red line) has petered out since the mid-2000s thanks to falling prices, but the number of working rotary oil rigs (blue line) has skyrocketed since January 2009. (A rotary rig is one used to explore for new oil.) If President Obama is hostile to new oil exploration, he sure has a funny way of showing it.